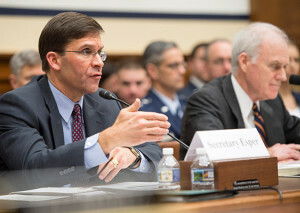 Secretary of the Army Dr. Mark T. Esper testifies at the House Armed Services Committee regarding the “Fiscal Year 2019 Budget Request,” March 20, 2018. “Our competitors are seeking to alter global strategic realities for their own benefit, often at the expense of U.S. interests and those of our allies and partners,” said Secretary of the Army Dr. Mark T. Esper during a testimony Tuesday before the House Armed Services Committee. He discussed, among other things, the Fiscal Year 2019 budget, acquisition reform, the current threat environment, and deterrence efforts in Europe. Esper explained how the European Deterrence Initiative, or EDI, is reassuring allies and deterring Russian aggression. During a recent trip to Europe, he described how he was heartened to see Soldiers from the Illinois National Guard training in Poland and Soldiers from the New York National Guard doing the same in Ukraine. This joint training is deeply reassuring to allies, he noted. Esper also noted that the Army’s commitment to keeping an armored brigade combat team in Europe on a rotational basis is another important aspect of deterrence. The current Armored Brigade Combat Team, or ABCT, in Europe is the 2nd ABCT of the 1st Infantry Division, out of Fort Riley, Kansas. They replaced the 3rd ABCT of the 4th Infantry Division out of Fort Carson, Colorado in October. A combat aviation brigade is also in Europe to support the maneuver force. Esper said those ABCTs are on nine-month rotations, and he said he expects that to continue, on a “heel-to-toe” basis, pending further assessment on the efficacy of using rotational forces. The secretary also said he was gratified to see NATO allies Poland, the United Kingdom and Italy training with U.S. forces at the Joint Multinational Readiness Center, in Grafenwoehr, Germany. 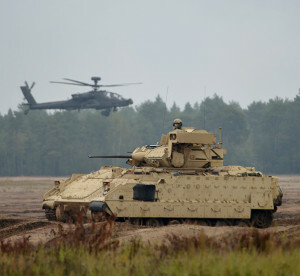 Esper also observed U.S. and NATO training in Poland and remarked that NATO Enhanced Forward Presence battle groups in the Baltic nations of Latvia, Lithuania and Estonia are the tip of the spear against the Russian border. During his European visit, Esper also got to go inside a Stryker and speak with Soldiers about its newly enhanced capabilities, including a 30mm cannon that will increase the vehicle’s lethality and a double-V hull for added protection. He noted that the funding for these capabilities was quickly made available through an “urgent operational needs” request. Esper said he’s particularly heartened that Congress has increased EDI funding over the last several years. The fiscal year 2017 budget provided $3.4 billion for the initiative. The amount requested in FY18 was $4.8 billion and the amount requested for FY19 was $6.5 billion, according to the “DOD EDI Budget Request” report, published by the Office of the Under Secretary of Defense (Comptroller) in February 2018. The majority of the funding goes to the Army, which has the largest land force in Europe with about 30,000 Soldiers. As such, of the fiscal 2019 DOD EDI request of $6.5 billion, the Army’s share is $4.6 billion. That money is used for such things as personnel costs, training, exercises, prepositioning supplies, electronic warfare and cyber countermeasures, equipment and munitions, improving infrastructure and building partner capacity, according to the report. Asked about challenges in Europe, the secretary responded that there are ongoing issues with troops crossing borders of NATO nations quickly due to strict border controls. Also, roads and bridges in Eastern Europe are often inadequate to support heavy ABCT vehicles like tanks. Esper also provided testimony on a number of other issues, including women in combat roles. Women are now successfully entering the combat arms branches, Esper said, adding that he spoke recently to some of those women at Fort Bragg and the National Training Center in Fort Irwin, Calif.
Esper noted that a future benefit to both male and female Soldiers will be improvement in the talent management arena. The Army is now getting ready to field the Integrated Personnel and Pay System – Army, which will, among other things, allow the Army to document a much wider array of talent than what it currently does. Apache helicopters from the 1st Attack Reconnaissance Battalion, 501st Aviation Regiment, Combat Aviation Brigade, regroup at a new battle position with Bradley Fighting Vehicles and Abrams tanks from the 5th Squadron, 4th Cavalry Regiment, 2nd Armored Brigade Combat Team, during a readiness demonstration, Presidenski Range, Trzebian, Poland, Sep. 25, 2017. U.S. Army Europe conducts frequent exercises with European and NATO allies to ensure security and deter Russian aggression. The first phase of IPPS-A will be fielded by the Army National Guard this fall and in the active and Army Reserve components next year. Esper spent the majority of his testimony discussing Futures Command and the money and time it would save in getting badly needed Army priorities through requirements to fielding, particularly in the six focus areas of: long-range precision fires, a next-generation combat vehicle, future vertical lift platforms, a mobile and expeditionary Army network, air and missile defense capabilities, and Soldier lethality. Esper said the Futures Command would reform the Army’s acquisition effort and instill accountability in the process, since it will be in a unified command when it is stood up this summer. He predicted that wiser and more efficient decision making will occur at the command because everyone will have a seat at the table early on in the process, from program managers and contract specialists, to invited members of industry and academia. Lawmakers noted that although this hearing was about the fiscal 2019 budget, the fiscal 2018 budget had still not been passed by Congress. Esper noted that operating under a continuing resolution for nearly six months limits funding for training and reduces the number of seats at Army schools. Continuing resolutions also limit the munitions that can be purchased and lowers readiness, Esper said. 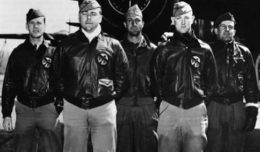 Secretary of the Air Force Heather Wilson, who also testified, agreed with Esper and reminded lawmakers that the military services are not yet out of the woods on the Budget Control Act of 2011, which introduced sequestration. She bluntly stated that the effects of sequestration have done more damage to U.S. security than that inflicted by its enemies.